There is really no point in remaking 1971's Willy Wonka & the Chocolate Factory because there will never be a better Wonka than Gene Wilder. He blended weird with a generally bright and very funny side. 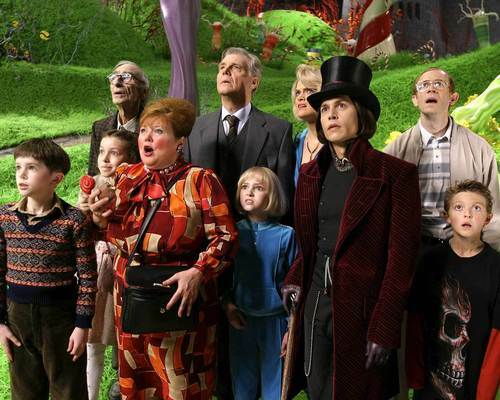 Charlie and the Chocolate Factory from 2005 employs Johnny Depp in Wilder's role, and Depp takes it in a weird, creepy, and fairly dark direction. The more technologically advanced versions of the factory are interesting, and Freddie Highmore as Charlie (he later goes on to star as Norman Bates in one of my favorite current shows, Bates Motel) is cute. But the Oompa-Loompas are no improvement upon the originals and the hiring of Depp and director Tim Burton is just all wrong. I bet casting Jack Black as Wonka would have been truly inspired. Before Burton was hired, some potential choices apparently included Nicolas Cage, Jim Carrey, Michael Keaton, Brad Pitt, Will Smith, and Adam Sandler. Even Wilder agreed that something was off. He refused to see the film and said Depp is a great actor (I agree) but that he didn't like the direction Depp was taking Wonka in some early clips he saw of the film. This is still a good film for kids, but please don't deny them a chance to see the original version as well.